Participants had a lot of fun playing the adaptation strategies game, because it enabled them to take on professional personas different from their own. We appreciate participants time and effort, especially since the highly interactive format allowed us to capture important concerns and ideas. The results from one professional workshop’s visioning exercise showing participants’ opinions about important features and functions of the Matanzas Basin, and ways to ensure effective sea level rise planning. The red stickers indicate top priorities. The project team will summarize and statistically analyze participants’ adaptation planning preferences. The results will be added to, and compared with, the preferences from other stakeholder workshops. The information will inform the next phase of the project to develop future land use scenarios and an adaptation strategies toolbox for the Matanzas area. The last professional workshop for developers, real estate and local businesses will be held at the GTM Research Reserve’s Marineland office on June 4th, 12:00-3:00 p.m. Lunch will be provided. Please see the link above to RSVP. The Matanzas project is funded by the National Estuarine Research Reserve System (NERRS) Science Collaborative, a program administered by the University of New Hampshire. The Science Collaborative program requires the projects it funds to demonstrate ongoing collaboration and applied science to coastal management problems identified by the research reserves. The Matanzas project’s public and professional workshops are examples of collaborative efforts with intended users. Matanzas area local governments and stakeholders will ultimately use our toolbox of adaptive strategies and scenarios to plan for sea level rise. The project is also designed to be transferable to other reserves within the National Estuarine Research Reserve System. 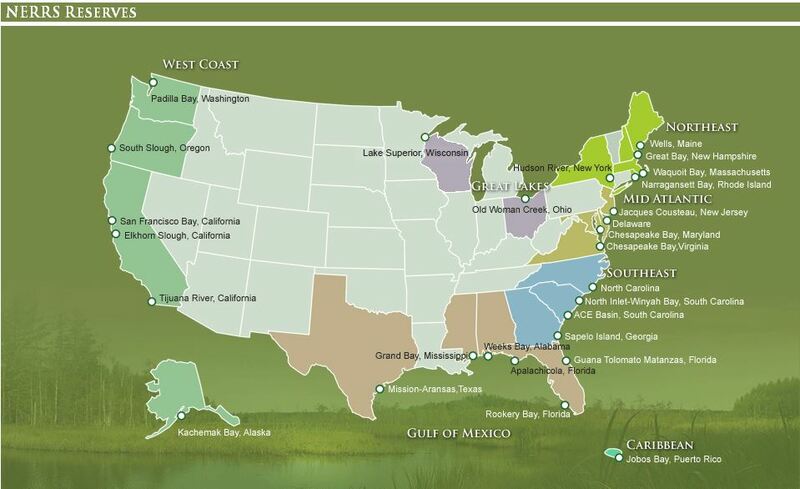 There are 28 research reserves across the country representing different biogeographic regions that are protected for long-term research, water-quality monitoring, education and coastal stewardship. As part of the Science Collaborative program’s oversight of the projects it funds, funding program manager Justine Stadler attended our professional workshops on May 8th and 9th. Following the workshops, the project’s Principal Investigator Kathryn Frank and Collaboration Lead Dawn Jourdan showed Justine some of the special places in the Matanzas area. The project team thanks Justine for participating in our collaborative process and joining us for an eco-adventure. Justine Stadler (left) and Dawn Jourdan (center) kayaking near Pellicer Creek with guide Brandon Mellin of Ripple Effect Ecotours. Dawn (left) and Justine walking along the shoreline of Summer Haven near the Matanzas Inlet. The impacts of sea level rise will become greater over time, affecting today’s youth the most. The Matanzas project Steering Committee members recognized the importance of engaging youth in planning for sea level rise, and the project team welcomed the opportunity. GTM Research Reserve’s coastal training specialist Tina Gordon coordinated with educators in the Matanzas area to offer sea level rise workshops to about 120 high school students and 30 community college students. The participants were six marine science classes at Matanzas High School in Palm Coast, and two environmental science classes at St. Johns River State College’s campus in St. Augustine. The workshop format was similar to that involving adult residents and professionals. As with the adult workshops, the youth provided ideas for sea level rise planning through a visioning exercise, and they worked in small groups during the role-play game to develop sea level rise adaptation plans. Despite participating in the same workshop activities, youth participants often reacted differently than adults. For example, the high school students approached sea level rise planning from personal rather than professional perspectives. The students showed a strong attachment to place, and they often favored strategies to fortify the area to make it livable despite sea level rise. Alternatively, participants in the adult workshops more frequently considered planned relocation as a viable adaptation strategy. The project team thanks Mr. Chris Farrell at St. Johns River State College and Mr. Chris Feist at Matanzas High School for arranging the workshops for their students. A workshop for middle school level kids will be held on June 26, 2013 as part of a summer camp at St. Johns Technical High School in St. Augustine. 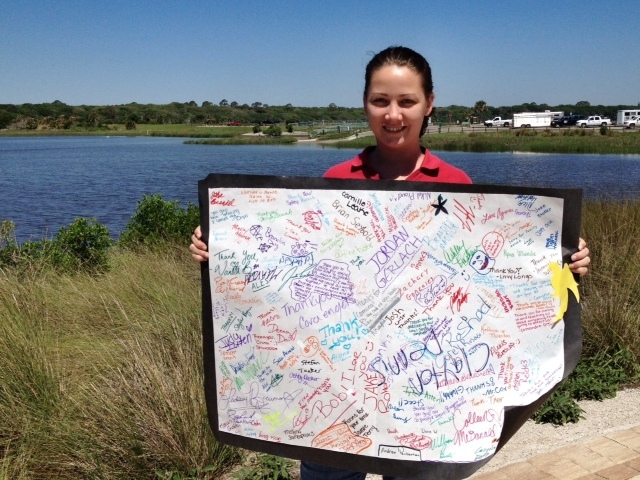 Tina Gordon, Coastal Training Specialist at the GTM Research Reserve, holds a giant thank you card presented to the project from Mr. Feist’s marine science students at Matanzas High School.